This is a guide to all of the University of Alberta Libraries geospatial data (GIS and Maps) resources and printed maps. Find and download any of the GeoGratis maps, data, and publications. The SLCs are a series of GIS coverages that show the major characteristics of soil and land for the whole country. SLCs were compiled at a scale of 1:1 million, and information is organized according to a uniform national set of soil and landscape criteria based on permanent natural attributes. National and prairie drought, precipitation and temperature maps. Global Forest Watch Canada works independently within the larger Global Forest Watch network of organizations. We monitor the state of Canada’s forests to provide quality information on development activity and environmental impacts. In 2015 AltaLIS made many Alberta GIS datasets available for download. GeoDiscover Alberta is a catalogue of geospatial, geomatics and geographic data for the province of Alberta. Interactive and PDF maps: mineral rights, natural gas, oil, oil sands, petrochemicals and tenure. Follow the links under "Our Business"; to publications and maps for each theme. An online version of this important reference atlas. Alberta Geological Survey AGS geological maps searchable by NTS or keyword. AGS Interactive maps of the Alberta geology, hydrogeology & water well chemistry, CO2 sources & basin suitability, sand and gravel deposits with aggregate resource potential and coalbed methane potential. Agricultural Region of Alberta Soil Inventory Database (AGRASID) digital database consisting of seamless Geographic Information System (GIS) coverages and relational data files which describe the soil landscapes for the 2700 townships within this region of the province. Published provincial soil survey reports and maps and soil resource information. Groundwater Assessment Reports in Alberta groundwater resources and characteristics for more than 50 counties and MDs in Alberta. Alberta's River Basins maps and hydrological information for the province’s major river basins. An interactive tool that helps producers, farm consultants, and researchers to see Alberta weather forecasts, browse over 10000 maps of Alberta weather and Alberta climate related information, and access near real time station data from over 350 meteorological stations operating in the province of Alberta. Covers a wide variety of climatic variables for the 1901-2013 time periods. Lots of great geospatial resources for the City of Edmonton, including zoning, rooflines and the 2014 city census. DMTI Spatial Solutions offers various products which include detailed street maps, census data and boundary information, postal geography, topographic maps and geographic features for all Canadian urban areas. Included are topographic coverage of 156 urban areas covering 76% of Canada's population (as of the 1996 Census); street names for communities of 1000+ population, and street addressing for communities of 2000+ population. Files from these datasets may be requested from the Data Library. The AltaLIS Post Secondary Education Data Partnership Project was initiated to support and facilitate the teaching of Geographic Information Systems (GIS) and academic research involving the geospatial analysis of data at post-secondary institutions in Alberta. To obtain any of the AltaLIS Post Secondary Education Data Partnership/AltaLIS datasets described below, contact the GIS Librarian Larry Laliberte. 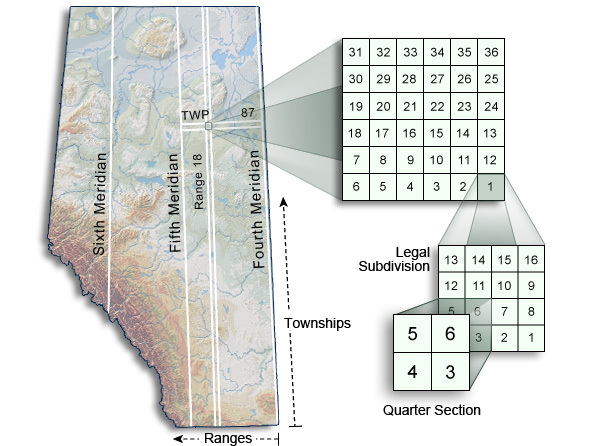 Provincial coverage of the Alberta Township System including Federal Land (National parks, Indian reserves and Metis Settlements). ATS polygons includes polygons for Legal Sub Divisions (LSD), quarter section, section, each with statutory road allowances & township polygons, derived from the ATS coordinates. Most of these layers are now available through AltaLIS. Includes Digital Elevation Models for the entire province at 10m resolution. The DEMs are available as 1:250000 tiles. Is a geospatial mapping product that maintains surface activity extents on Crown Land within the Province of Alberta. Disposition mapping is used for regulatory, permitting and planning applications, by industry, public and private sectors. Provides indexing, abstracting of and citation linking to journals in science, technology, medicine, and the social sciences. William C. Wonders Map Collection Database Description of this database. Atlases, gazetteers and other cartographic reference materials are catalogued in The NEOS Libraries' Catalogue. Post-1994 monographic maps and new series in print or electronic format are catalogued in The NEOS Libraries' Catalogue. Some pre-1995 maps may also appear in the NEOS Libraries' Catalogue. The airphoto collection of over one million items is not included in this database.